Cosentino, Frank. "Daniel Igali". The Canadian Encyclopedia, 27 July 2015, Historica Canada. https://www.thecanadianencyclopedia.ca/en/article/daniel-igali. Accessed 18 April 2019. Daniel Igali began wrestling at the age of 16 and entered the Nigerian National Senior Tournament. Despite the absence of designated age groups, Daniel Igali won his division. Freestyle wrestler Daniel Igali at the Sydney Olympics in 2000. He won a gold medal victory over Russian Arsen Gitinov in the 69 kg wrestling competition. Igali won the hearts of Canadians when he wore the Canadian flag as a cape, then placed it carefully on the mat and knelt to kiss it (photo by J. Pat Carter, courtesy CP Archives). Daniel Igali, wrestler (b at Port Harcourt, Nigeria, 3 Feb 1974). 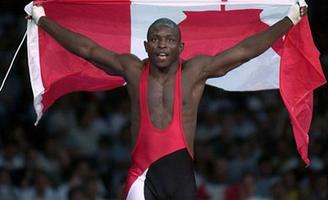 Daniel Igali is Canada's first-ever gold medalist in Olympic wrestling. Igali grew up in Nigeria as one of 21 children. Wrestling was an important part of the culture of the Ijaw tribe. Each match was accompanied by drumming, thought to be instructing the wrestler during the match, with traditional tribal wrestling songs being hummed in the background. Victory was gained with a single takedown. Daniel Igali began wrestling at the age of 16 and entered the Nigerian National Senior Tournament. Despite the absence of designated age groups, Daniel Igali won his division. He attracted the attention of Plateau State University in Northern Nigeria, where he entered a program in mass communications while now concentrating on Greco Roman Style wrestling. All the rules of international freestyle prevailed, with the exception that no holds below the waist were allowed. Disappointment forced him to change styles once again. In 1992 he trained hard, losing 8 kg to make the necessary 62 kg weight class. He represented Nigeria at the 1994 Commonwealth Games in Victoria, finishing 11th. He decided to remain in Canada, enrolling at Simon Fraser University where he won 116 consecutive matches over three years. In 1998 he was fourth at the World Championships and second at the World Cup. He became a citizen in 1998. On 30 September 1999 at Ankara, Turkey, he won the title in the 69 kg grouping, automatically qualifying for the Olympics. He was the first Canadian to win the world championship. He had been motivated by his adoptive mother, Maureen Matheny, who was dying of cancer and whom Igali described as his greatest inspiration. Her last words to him as he showed her the World Championship medal were "I am so proud of you." Daniel Igali's success continued. He was selected for the Norton H. Crowe Award as Canada's Amateur Athlete of the Year, and won his division at the Senior National Championships as a member of his Burnaby Mountain Wrestling team. Igali spent much of his time preparing at Olympic Camp in Calgary, where the altitude contributed to an awareness of the need for greater conditioning. His attendance at the US trials enabled him to scout out possible opponents. Daniel Igali's Olympic gold-medal performance began with his first match against a Georgian whom he had beaten at the World championships the year earlier. He did so again. His second bout against an Iranian ended in victory after, as the result of a tie, rules called for other criteria to be used to determine the winner. He moved into the quarter-finals and beat Yosmany Sanchez of Cuba and, after another overtime match, Lincoln McIlravy of the US. Igali's competition for the gold medal was the Russian Arsen Gitinov. He moved to an early 4-0, lead but the Russian rallied to tie the bout and the first round finished at 4-4. In the second, Igali scored a quick two points for taking the Russian to the down position and a third for exposing his back to the mat. It gave him a 7-4 victory and the gold medal. In celebration, Igali wore the Canadian flag as a cape, removed it and placed it carefully on the mat. He ran around it, clockwise and counter-clockwise, then knelt to kiss it. Tears streamed down his face at the playing of the national anthem at the medal presentation. Igali amassed one additional international title, a gold at the Commonwealth Games in 2002, before retiring from competition. He continues to devote time to philanthropic endeavors. He initiated a joint project with students at Heritage Park School in Mission, BC, in 2001 to build a school and gymnasium in Eniwari, Nigeria, where he grew up. The school, which opened in 2006,was named after his adoptive mother, Maureen Matheny, his greatest inspiration. In 2002 he created the Daniel Igali Foundation, an organization that helps young people in developing countries achieve academic and career goals. Daniel Igali was inducted into Canada's Sports Hall of Fame in 2007, and into the Canadian Olympic Hall of Fame in 2012.